The BioInitiative Working Group concluded in 2007 that existing public safety limits for electro-magnetic-fields (EMF) were inadequate to protect public health, and agreed that new, biologically-based public safety limits were needed five years ago. The BioInitiative Report was been prepared by more than a dozen world-recognized experts in science and public health policy; and outside reviewers also contributed valuable content and perspective. From a public health standpoint, experts reasoned that it was not in the public interest to wait. In 2007, the evidence at hand coupled with the enormous populations-placed-at-possible risk was argued as sufficient to warranted strong precautionary measures for RFR, and lowered safety limits for ELF-EMF. The ELF recommendations were biologically-based and reflected the ELF levels consistently associated with increased risk of childhood cancer, and further incorporated a safety factor that is proportionate to others used in similar circumstances. The public health cost of doing nothing was judged to be unacceptable in 2007. What has changed in 2012-Report? In twenty-four technical chapters, the contributing authors discuss the content and implications of about 1800 new studies. 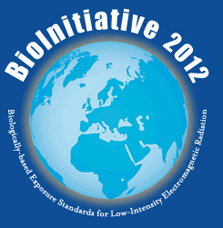 This entry was posted in emf and tagged bioinitiative, EMF on 2013/01/07 by joachim-w.